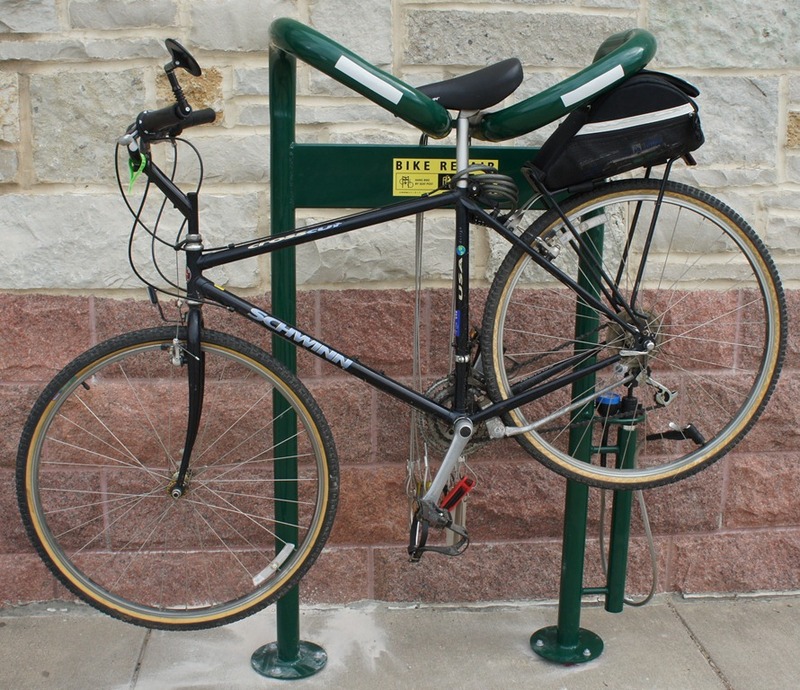 St. Olaf debuts cool bike repair stations. We need these downtown. 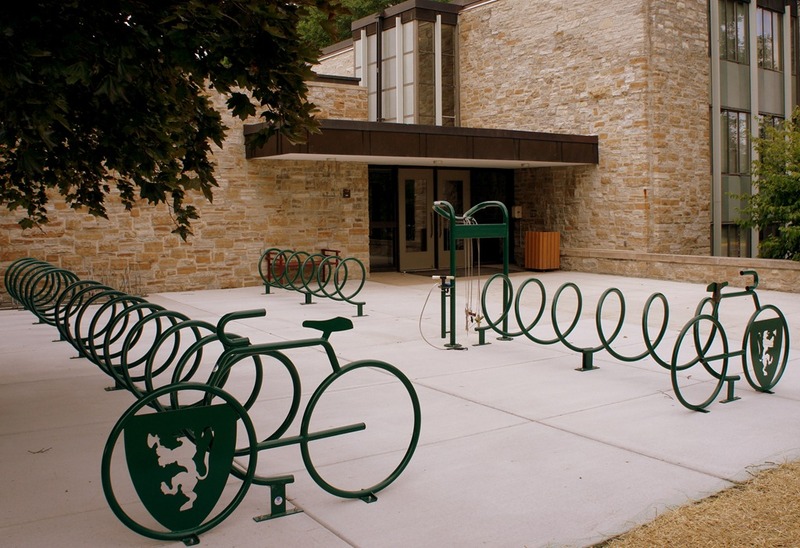 I got a call today from Jim Fisher, Grounds Manager at St. Olaf, alerting me to the new bike repair stands that he was installing today around the campus. 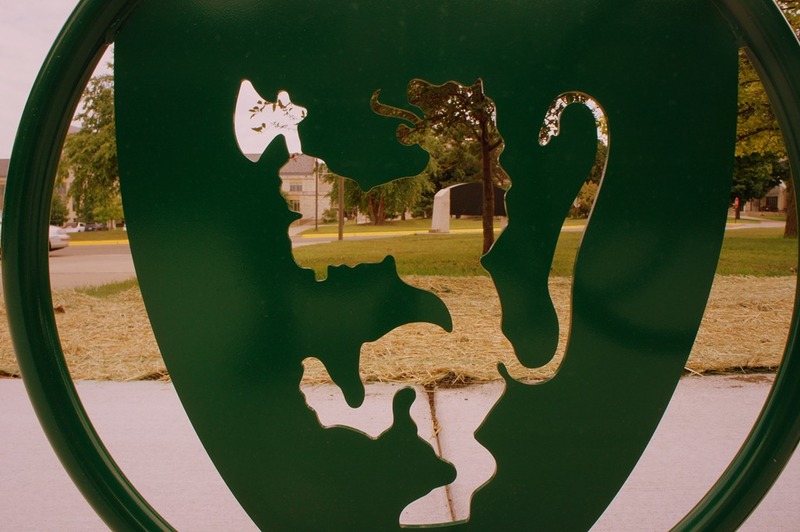 I took these photos of the one on the northside of Buntrock Commons, adjacent to the entrance to Lion’s Pause. 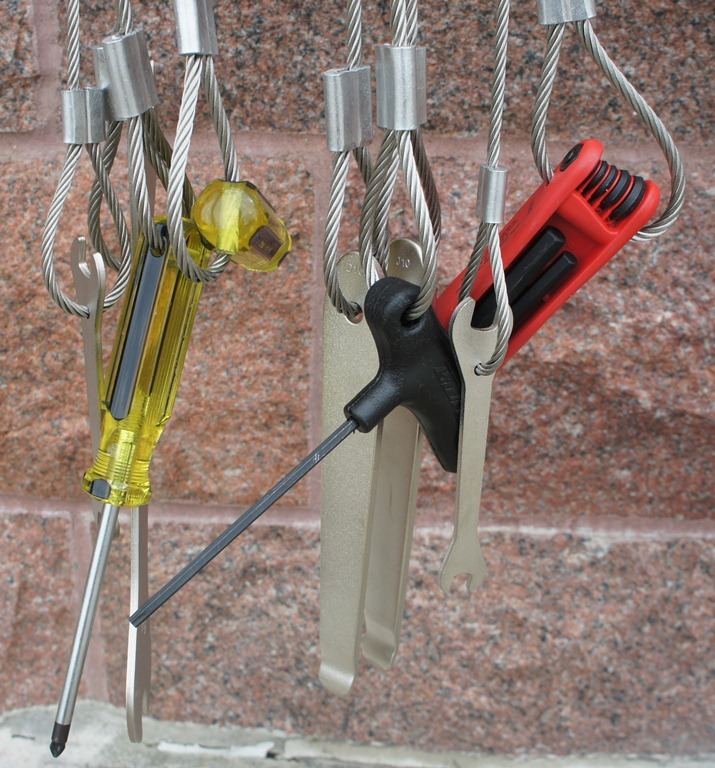 The bike repair stand (Dero Fixit) includes an air pump with a gauge, and seven tools, all tethered with security cables. 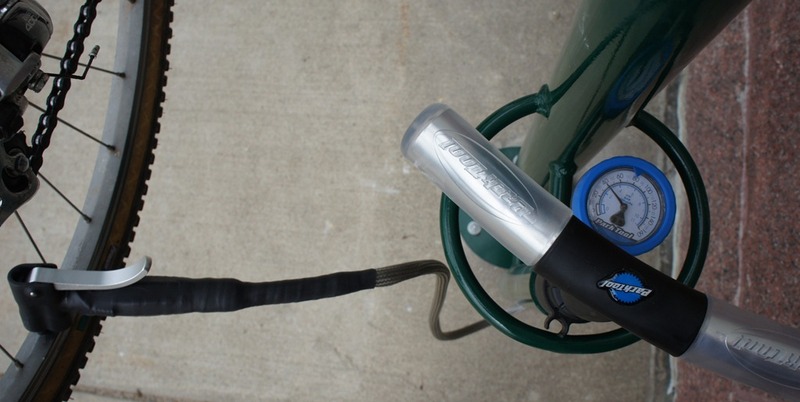 You can hang your bike on the stand by its seat post so you can more easily work on it. Northfield’s downtown Streetscape Task Force should consider installing one or more of these downtown. 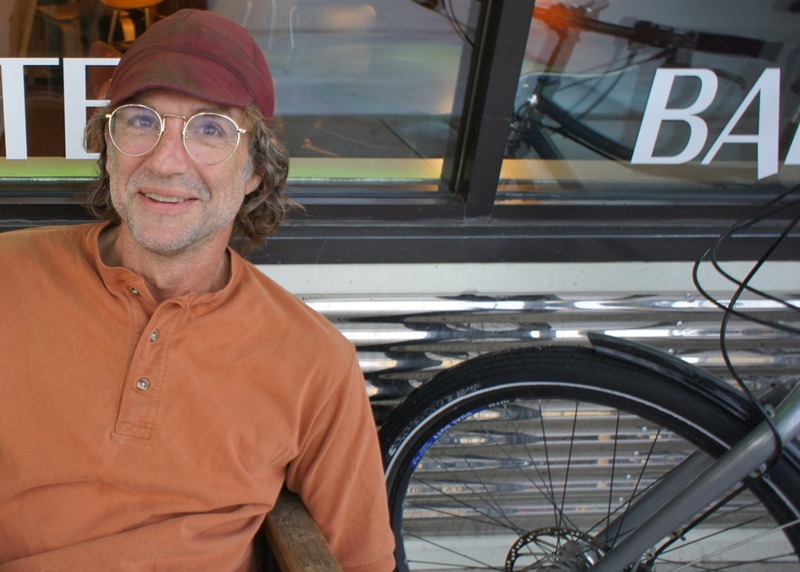 Jim Fisher alerted me to another bike repair he installed at one of the St. Olaf dorms, this time with new bike racks… with an artistic flair. Thanks for the posting Griff. I currently have two more units on hand. Will be installing one near Tostrud Center and one near the Pump house on St. Olaf Ave. or at the base of the Library stairs. I have a fourth one on order that will be incorporated into an upcoming summer project. It is great to work for an institution that supports thinking and acting outside the box. Jeez, 4 of them? That’s great, Jim. Hayes and Dan, can you consider getting this on the agenda of next week’s Streetscape Task Force meeting? Yes four. I have over 3000 potential “clients” and given the topographic issues of the campus I want to make every effort I can to make the campus as bicycle friendly as I possible am able to. I cannot do much about the hills but I can try and provide services. That’s pretty nifty. I’m familiar with Dero bike parking, but haven’t seen this product. Maybe we can swap out a couple of racks we’re proposing to buy in deference to this item. This would be perfect for the future transit hub behind Walgreen’s and the trailhead that Mill Towns Trail is going to build in Dundas. very cool device. Griff, you should add a couple of photos of Jim and his troll and big dummy. those racks would be a good addition to any bike trail. Very cool! In Copenhagen, large grocery stores, public buildings, and of course bike shops have pumps/air available to passing cyclists. But even those are not as slick as this setup. 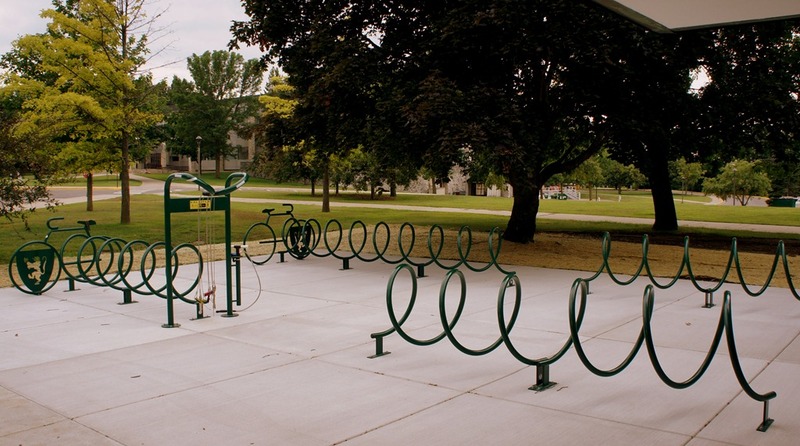 Jim– has the grounds department considered doing anything for winter bicycle parking? I know it would be a lot of work to keep all the regular racks shoveled out, but a good number of cyclists keep riding during the winter — as the bikes all around Buntrock indicate. It would be awesome if there were some sort of covered, shedlike structure (possibly open on the sides) where bikes could be kept, but protected from snow piling up. Jim Fisher alerted me to another bike repair he installed at one of the St. Olaf dorms, this time with new bike rack — with an artistic flair. See the updated blog post above with 3 new photos. 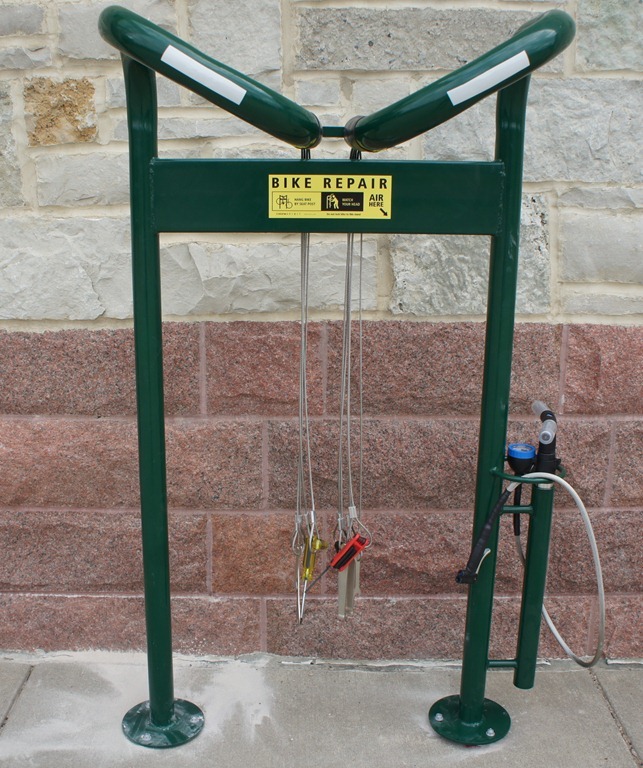 Ross Currier told me this week that the Downtown Streetscape Task Force is considering installing one of these bicycle repair stations. Hooray! That’s great news, Griff! Any idea where [else] we could voice our support to the task force? Michael, the Streetscape Task Force has a page on the City’s website but the list of members there is reportedly out of date. I’ve complained about that repeatedly, to no avail. Hayes Scriven (Northfield Historical Society Executive Director) is still on the Task Force and he’s been active here on LoGro. You might want to contact him via the NHS Contact Page.